Less than two days remain before the ordering window closes for the special-edition 2013-W $50 Reverse Proof Gold Buffalo from the United States Mint. Before that happens, there is a chance its price could advance for the third time since launching on August 8, 2013. Collectors will have until September 5, 2013 to place orders for the one-ounce, 24-karat gold coin sporting a reverse proof finish that celebrates the centennial anniversary of James Earle Fraser’s designs. The ordering window ends promptly on Thursday at 5 PM ET. Sales for the Gold Buffalo hit 42,795 as of Tuesday, reflecting a bump of 1,991 during the extended Labor Day weekend. On Wednesday at around noon ET, there is another possibility that the Gold Buffalo’s price could move up $50 to $1,790. Previous $50 price increases kicked in for the coin on August 14 and then again on August 21. They were made in accordance with U.S. Mint policy to better match product pricing with the rising market value of gold. The most recent price hike happened when the weekly gold average moved higher to within the Mint’s coin pricing range of $1,350.00 to $1,399.99 an ounce. While Wednesday’s London AM gold fixing must still be considered, the current average for gold is $3.03 shy of $1,400 an ounce, the mark that would trigger higher prices among the Mint’s numismatic gold coins. For the weekly average to reach that point, Wednesday’s AM gold fix would need to climb above $1,424.20 an ounce. As of this writing, the spot price of the precious metal jumped almost $16 to $1,413.60 an ounce with safe-haven demand rising as Syria tensions mount. Coin News Update: The United States Mint will not increase the price of its numismatic gold coins, including the American Gold Buffalo. Gold prices retreated Wednesday morning as investors booked profits. The London AM gold fix on Wednesday was $1,403.75 an ounce. This coin news article will be updated with what actually happens. When looking at day-to-day sales of the 2013-W Reverse Proof Gold Buffalo, shown here, orders pick-up right before an anticipated price hike. Sales then retreat in the following days until new traction is found. Normally, there is a solid ordering bump on the day a product is known to go off sale. That could change this time. If it seems a price increase is in the works, sales on Wednesday could show the higher point. 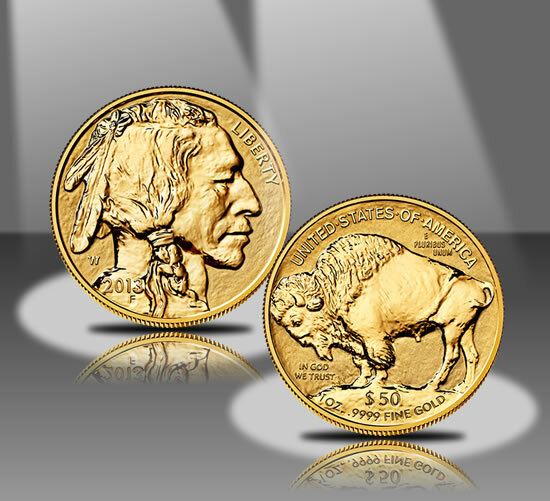 The standard version and the anniversary reverse proof American Gold Buffalo are available through the U.S. Mint webpage found here. What’s the delay in delivery? There isn’t a huge number involved, why the delay. A month an still no shipping date. Poggie they sold ours in Chicago. Order mine day 1, reloading the page until it was able to be added to my cart. They finally took my money today but still no ship confirmation. Order # 419240XX. Already seeing them for sale in OGP on the internet. Still have only received 1 of the 4 West Point Eagle sets as well. If the mintage can stay below 49,263, ( which today the mintage was updated from the mint to approx:45,912 ), The final tally should be tomorrow after 3 pm est. That mintage should (imo) be pretty good. I was comparing the regular 24k buffaloes in proof. We shall see. Nice low mintage for a first year coin. Well, The final tally according to the U.S. Mint on the r.p.g.b. is 47,836.. Not bad. According to what i’m seeing , if the tally stays at that number, It will be (as for now, The 4th lowest in the group of proofs since 2006 On the reg. proof buff’s . When did you guys order on day 1? I had two separate orders, one at 3 minutes past, one a 5 minutes past. Both arrived on 8/22, and are already at NGC. I suspect we’ll see sub-45K units when the final tally comes out. Just 25 minutes past Backroad. Received my coin 8/22 also. Going to get the brown label by NGC. So i’m in no hurry to have it graded. Just received my WP ASE coins from NGC the other day. Got two 70’s & two 69’s one of each coin brown label. Very happy.